Off-the-shelf cabinets typically won’t easily fit your space. 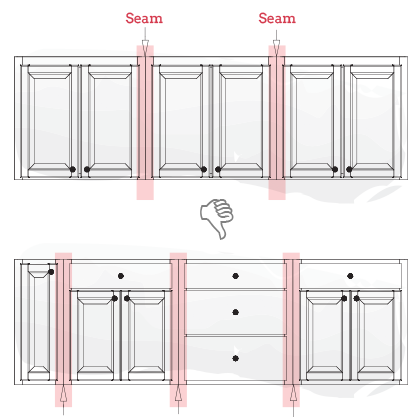 Filler strips between cabinets may be required which are not very attractive, and reduces the total amount of space available for storage. 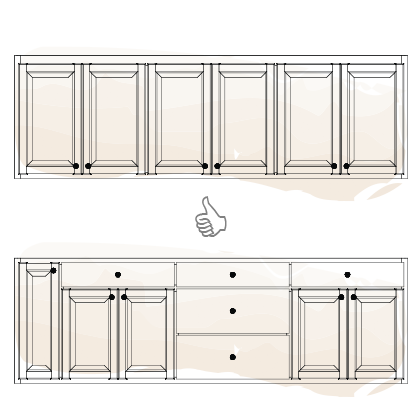 Our method of Continuous Cabinet Construction maximizes interior space, reduces bulky seams and just looks better. Our cabinets are custom built to fit your home and your lifestyle. They are built from the best materials and woods, ensuring they’ll last for the life of your home. No other supplier can match the value we build into each cabinet, and your home. In order for Home Centers and Interior Design studios to profit on cabinets, the cabinets have to be made as efficiently, and cheaply as possible. Who knows who builds them, and you generally cannot evaluate the quality of the cabinet before they show up at your house. Confident Weekend Warrior DIYers can probably install cabinets themselves. But when they don’t fit or there’s no stud to fasten to, or the doors open and close by themselves, you’re left with a major headache. Leave the challenges to the pros. Call Vogl’s Woodworking instead.